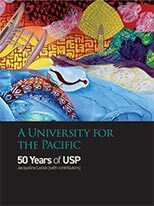 To mark the occasion of the 50th Anniversary of The University of the South Pacific this commemorative book, rich with stories and photographs from throughout the 50 year life of USP, has been produced. It is a must for anyone who has studied, worked or visited the University at any point in its long and fascinating history. I have been on the editorial board for the book – which will be launched on the Laucala Bay campus in Fiji on 29 October.